Roj Blake and the rest of the Liberator crew attempt to free a ship full of prisoners being taken by the Federation to a penal planet. But some of the prisoners are not what was expected. Add to the mix Travis, Servalan and some mutoids and the result is a tense tale combining humour, horror and science fiction. 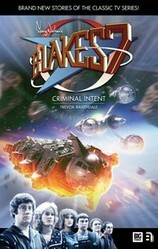 The latest Blake’s 7 novel from Big Finish is Criminal Intent by Trevor Baxendale. This is set during the first season of the original BBC television series. With the Liberator crew having experienced not long ago being in a Federation prisoner transporter ship, it comes as no surprise when Blake decides to rescue another bunch of prisoners suffering a similar fate. But one of those prisoners is more than he seems. The rescue attempt also means that Servalan now knows where Blake is, and despatches Travis to the scene. But Travis is also in the dark about Servalan’s true motives. Is Criminal Intent any good? With humour from the start, this is a well written novel that most Blake’s 7 fans should enjoy. Mutoids play a big part in the story, which fits with Travis’ often stated preference for them, though their enhancements seem to go beyond what was suggested in the television series; the enhancements made to Travis’ missing eye also seem to be more than in the TV version. However, the existence of a zombie mutoid was brilliant, adding a nice touch of horror to the proceedings. Travis is accompanied by a mutoid called Keira whom he has a particular interest in. We can assume this is the same mutoid as Keera in the television series as there is a reference to Travis having saved her from a court martial and at the end of the episode Duel she was threatened with court martial. A continuity error from the original series that many fans will probably spot is that Travis’ pursuit ship is fitted with a stardrive. This story is set in season one and, though it is possible Dr Paxton had already started work on a stardrive, it had not been fitted to any ships. The first mention of a stardrive was not made in the show until season four when it was discovered the space rats had a Mark I stardrive fitted to their choppers. The Scorpio became the first ship fitted with a Mark II stardrive. But these are minor gripes. Overall this is a fast moving story, full of excitement and tension. And the biovores are deliciously horrible. After a good start by Big Finish with the Blake’s 7 novels, the quality had slipped a bit but this is back up with the best of them. Criminal Intent (ISBN 978-1-78178-383-2, 224 pages), published in 2014 by Big Finish. Production code is BFPB7BOOK006. Cover art is by Anthony Lamb. It is available as a hard back and e-book. A look at Paul Darrow's second Big Finish novel telling what happened after the end of the classic BBC television series Blake's 7.